No, it is not a French take-out: Jean Dubuffet was a self-taught French painter and sculptor that rejected the formal teaching of art for considering it to be oppressive. In the course of his life, he had two gaps in which he distanced from artistic production. However, in 1942 he returned to painting and coined the concept of Art brut, a rough art free from intellectual concerns but rested in primal values such us instinct, passion and madness. It is the art produced by the non professionals: the insane, the prisoners and the children; and, of course, himself. This kind of art served itself from rudimentary and, often, puerile figures. From 1960 on, Dubuffet, inspired in doodles he made when he was at the phone, began with a series of paintings with a palette exclusively composed by the colors red, blue and black. 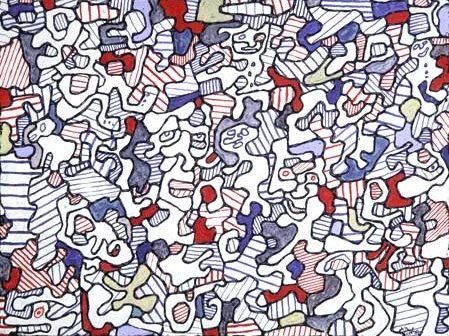 Comes and goes is one of the main work of this series, like a puzzle in which is almost impossible to difference the individual elements (apart from the hidden faces) and, for Dubuffet’ sake, to intellectually interpret it. ~ by Álvaro Mazzino on July 12, 2010. These complaints will grow if and when the update hits more U.S. carriers and more international versions of these devices. We also expect to hear about Galaxy Note 4 Android 5.1.1 problems. This entry was posted on July 12, 2010 at 11:28 and is filed under Surrealism.You can follow any responses to this entry through the RSS 2.0 feed.You can leave a response, or trackback from your own site.